It was a beautiful day, late afternoon, in what used to be called “Indian Summer,” November 30, 1864, when the Confederate army of Tennessee, moving North, began to arrive a mile or two due south of the little town of Franklin, Tennessee. The leading units of the long column were made to halt on the dusty road. The soldiers were tired, having just made a hard fifteen mile march from the tiny hamlet of Spring Hill where they had camped the evening before. Though they couldn’t be sure of it, they felt something in the air, a palpable energy, a distinct sense of foreboding. And from the anxious glimpses of sober general and staff officers they sensed it even more. Still they rested on their rifles for a few minutes and tried to relax. Their common sense knew the hour of the day, that little daylight was left. The army was behind them and in less than two hours it would be dark. No time for infantry to form into battle lines-no sir. The men in the lead elements of that long column of thirty-five thousand rebels,the majority of whom were veterans, had seen no artillery. Their batteries had to be far behind. If the enemy under General Schofield was dug in and waiting for them up ahead in Franklin, no officer with a “lick of sense” would attack such a well situated enemy force,an army they had been chasing for several days, without a preliminary bombardment of field artillery. Even the headstrong, daring John B. Hood, their youthful one-legged commander, would never order an attack without artillery support and little daylight remaining. Artillerymen had to be able to see their targets. It was simply too late in the day for the whole gang to get to the battlefield. They’d never arrive in time-way too far back. No, the men surely breathed a sigh of relief, sure that that they would shortly be sent into the fields stretching on either side of the road, make campfires, and bed down for the night. If a battle was to be fought, it would be tomorrow. And private soldiers had learned to worry about tomorrow when it came, to let the day’s own troubles be sufficient for the day. The Federal troops crouching behind those newly constructed earthworks ringing the village looked at each other in utter bewilderment, stunned that the Rebels would attack such a strong position in such a manner out in open fields with virtually no cover. Officers with field glasses mesmerized by the spectacle, shook their heads in disbelief. Though they had not anticipated such a thing, as veterans of many hot fights, they had wisely prepared for it. Sergeants and officers moved along the lines of nervous infantry steadying them,making sure that they were ready to”greet” their enemy with everything they could throw at them as soon as they came in range, artillery loaded with canister (like a great shotgun) and thousands of rifles, many of them Spencer repeating rifles, accurate up to four hundred yards. And so they did. It was a god-awful slaughter, most of it fought after dark, a fight that even battle hardened veterans such as Sam Watkins, (quoted above), would remember as the worst of the war- for the Southern soldiers. The carnage lasted approximately five hours, until the Federal forces abandoned their positions and headed for Nashville. The exhausted, bloodied Southern army, shot all to pieces, did not and could not pursue. Six Southern generals, including the gallant “Pat Cleburne”, were killed. The lucky units placed in the rear of the Southern army who had missed out on the battle, marched into the town into a macabre scene in the dark tripping over the bodies of their fallen comrades, hearing the pitiful cries of the wounded from every direction. Even to the veterans, it was like nothing they had ever seen. Technically, it was a Southern victory. But, like the battle of Bunker Hill in the Revolution, it was the kind of “victory” that could not be celebrated. It had come at a terrible cost. And the Federal army, the fox that they had been chasing and hoped to bag, got away. 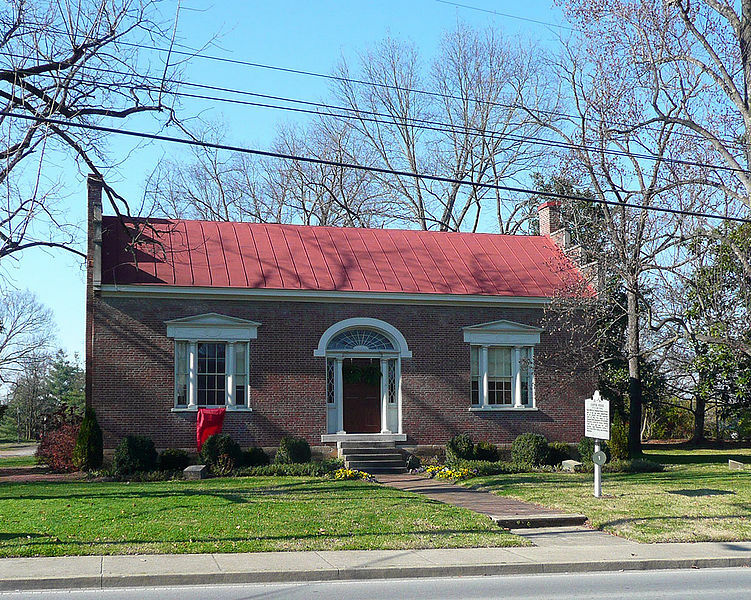 Nowadays the town of Franklin is a peaceful but bustling, prosperous community and one would scarcely guess that it had hosted such an event unless he makes a visit to the Carter House, a structure that still bears the scars of the battle, now maintained as a historic site and museum and open to the public. A mile or two away the Carton mansion, where four dead generals were laid out on the back porch is open to the public as well. In a well tended enclosed cemetery on the property over two thousand Confederates lie buried, all casualties of the battle of Franklin. Though most were killed outright, many buried in the Carnton cemetery were men who later died of wounds suffered during that intense fight. On WInstead Hill, where the Southern generals gathered for a brief conference prior to the battle, there are monuments to the fallen generals, a historical tablet or two, and a picnic area. More Confederates died as a result of the battle of Franklin in five hours than American soldiers have died in ten years of the current Afghanistan war.One can make the case that the final hopes of the Southern Confederacy died at Franklin on November 30, 1864. A few days later the remnants of the Southern army limped into Davidson County and laid “siege” to the city of Nashville. This time General Hood, his army now depleted and understrength, could only order his men to dig into the hills south of town in a long thin line stretching East to West and hope that his enemy would concentrate his assaults only along a strong portion of his line in as foolish a manner as he had done at Franklin. It was a fool’s hope. His opponent George Thomas, a competent veteran,one of the best officers in Federal army, didn’t oblige. On Dec.15 and 16th his troops made the attack. Thomas had enough men to attack all along the Southern line, the strong and the weak portions. At Shy’s Hill on Dec.16, the weak portion of Hood’s line (on the left) collapsed and like a line of dominoes, the rest of the Confederate line followed suit. By the end of the day Franklin Road and Granny White Pike were jammed with fleeing rebels headed South. They would have to pass again through the town of Franklin where they had been so terribly mauled two weeks before with yet another sad, humiliating story to tell. The outcome of the Battle of Nashville was never really in doubt. The Southern troops, tired, demoralized, hungry, and freezing, had had it. They fought back as brave as ever but were overrun and sent packing by a much larger, rested, well- armed, well-fed, and well clothed enemy army in a battle described by many historians as the most complete victory of our Civil War. Though the loses in killed and wounded at Nashville were nothing like what had been suffered at Franklin, two to three thousand rebels were captured and thus taken out of the war. The Confederate army that finally stopped it’s retreat and made camp in Alabama after Christmas in late 1864 was a mere shadow of the army that had lined up south of Franklin and launched that furious and tragic assault of November 30. For all practical purposes, the Western theater of the war was over. A little over three months later it all ended with the surrenders of R.E. Lee and J.E. Johnston’s armies in the East. To learn more about the Battle of Franklin, I highly recommend two books: EMBRACE AN ANGRY WIND by Wiley Sword and THE BLACK FLOWER, a novel by Howard Bahr. And, of course, there is the book quoted above, and already recommended in this blog: CO. AYTCH by our old friend Sam Watkins. He was there and saw it all. Thanksgiving. It’s always the fourth Thursday in November, a little easier to figure out than Easter, which is based, I think, on the lunar calendar, a calendar no one pays much attention to anymore. (Living in the city with so much ambient light, we’re lucky to get a glimpse of the moon at all) Initially a harvest festival, a Thanksgiving holiday at this time of the year is still a common occurrence across the world in the temperate Northern Hemisphere. The US holiday, which had been celebrated on various days in the Fall by the thirty two states prior to 1863, was then officially established by presidential decree as an attempt at national unity at a time when unity was in short supply. Abraham Lincoln ordered the holiday to be held on the LAST Thursday of November. Wanting to improve on this, Franklin Roosevelt, years later, stipulated that it be held on the 4th Thursday of November which IS the last Thursday most of the time but occasionally November has five Thursdays, putting Thanksgiving very late, maybe even on the last day of the month, and FDR didn’t want that. So the fourth Thursday it was. Here in what is now the United States historians have identified harvest celebrations occurring at Jamestown and with the Spanish at St. Augustine occurring even earlier than 1621. But whatever they were doing in Jamestown and St. Augustine has been forgotten. Indeed we scarcely remember Florida as a Spanish possession at all. Yet it was until well into the 19th century, a time when the old Spanish empire contracted and contracted and finally, for the most part, went away, a process the US was eager to facilitate. The Thanksgiving celebration we all know started with the “Pilgrims” in the Plymouth settlement located in what is now called Massachusetts in the Fall of 1621. We’ve all seen pictures of English settlers wearing funny large white collars atop dark somber clothes, tall stovepipe hats with big buckles and full skirted women dressed similarly. Well, there were no hats for them but large white bonnets. Men and women dressed different back then. And clothing was worn for warmth and propriety, not comfort. When it was hot, they simply shed a layer or two. Only the local “savages” considered comfort and had, it seemed, an altogether different sense of propriety. Though they had seen and fired a few musket rounds at shadowy groups of locals at first, the Pilgrims never exchanged pleasantries and actually communicated with any of the locals until a large fellow boldly strolled into the new English village one auspicious day in March of 1621 and with a big grin introduced himself in broken English as “Samoset.” He was, so the witnesses later indicated, clad only in moccasins and a tiny strip of leather about his waist. As to gender there was no question. The English were not accustomed to that sort of thing. But the Pilgrims were intensely interested in what Samoset had to say. And one of the first things he told them was that a terrible plague had decimated many of the locals prior to the Pilgrim’s arrival, something that they had already suspected after coming upon abandoned villages in their brief explorations of the area soon after their arrival. He had learned English from another local, Squanto, who had been abducted by fishermen and sent to England years before. Indeed, Samoset and the locals had been seeing English ships for years but this was the first time they had seen women and children. This was something different. This was a settlement. These people weren’t merely visiting. They had come to stay-do or die. And the locals weren’t sure what to make of it. And die they did. We all know that the first winter was an especially hard one. About half of the Pilgrims perished, leaving only about twenty musket-toting men at arms to deal with any hostile natives. In spite of the plagues that had swept the area, the natives in the neighborhood easily outnumbered the Pilgrims. And that was just the groups in the immediate area. Knowing this, the Pilgrim leader William Bradford did a very sensible thing. He called for a meeting and bestowed gifts upon Massasoit, a local sachem, or chief, and formed a solid alliance. Massasoit, surrounded by many old enemies, wanted the whites, who he believed could spread the plagues (Smallpox) as they wished, on his side. Since he feared the whites, he knew that his old enemies, if they had any sense, would do likewise. These odd looking visitors had something to offer. It was a good alliance-mutually beneficial. So Massasoit did what he could to help. The remaining Pilgrims were hungry and desperate. He didn’t want his new allies to starve to death. So he sent Squanto to help them grow crops and his help proved invaluable. He taught them how to grow corn or maize, something unknown in England or Europe, a valuable, versatile crop that would grow well in the Massachusetts soil and climate. A dead fish at regular intervals in the soil was the fertilizer. Many of the Pilgrims missed their beer but growing barley to make beer would have to wait. This I understand well. First one needs to eat. Years later whites would learn that with corn one could do both. And it could be made into something far more interesting than beer: whiskey. Or as the natives called it: “Firewater”. Many natives came to rue the day they introduced corn to the white man. Later sachems would wish that their fathers had simply ignored the pathetic overdressed palefaces and let them starve. But that’s another story. One of the great myths of the American Indian and of the Pilgrim-Thanksgiving story is that the natives simply took pity on the poor struggling Pilgrims and thus offered help. Though pity may have played some part, the truth is simply that Massasoit wanted a powerful new ally in his old struggle with rival tribes and the Pilgrims, with their ability to spread the terrible Smallpox, or so he believed, were a good choice. The natives saw the Pilgrims dropping for lots of reasons, but not from Smallpox. An alliance with these new folks seemed the sensible thing to do. If he didn’t do it, one of his enemies would. It was a good year. The death and birth rate evened out with the Pilgrims and their crops grew. The Harvest was much better than expected and it was time for a feast. At the appointed day the natives came, about a hundred of them, outnumbering whites about two to one, bringing lots of wild game. Though it is doubtful that they enjoyed dressing and cranberry sauce or pumpkin pie, they had plenty to eat-including wild turkey. It was a big memorable dinner on the grounds-the first real meal the newcomers had had since their arrival. And it did really happen. That part of the Pilgrim story is quite true. But there was a problem. The colony at Plymouth was poorly located and grew slowly. A few years later John Winthrop’s colony to the North, situated on a much better natural harbor, comprised of a much different and larger bunch calling themselves “Puritans”, thrived. And the Plymouth colony and anything that had happened there, was, in time, all but forgotten. For nearly a year I used to drive around a monument to the Pilgrims. 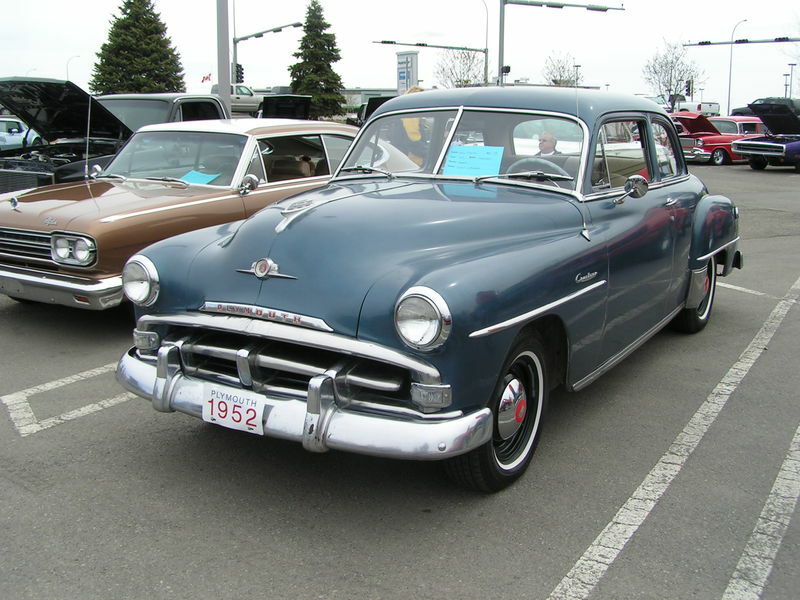 In 1970 my father bought me my first car-a 1951 Plymouth “Cranbrook.” It cost $100. The hood ornament was (you guessed it) a ship, the “Mayflower.” This auto was as heavy as an M-4 Sherman tank, had a “three-speed on the column” shift, a “flat-head six” engine, and wool-faced seats. I loved it. We had names for our cars back then, I called it: “the Mayflower.” When it went to the junkyard in the late Spring of 1971, it had surely given me more than $100 worth of service. For that I was thankful. It was a steel monument on wheels to those founding fathers (and mothers) who landed in 1620 on Plymouth Rock. But it, like the Pilgrims, is long gone. This story is brilliantly told in Nathaniel Philbrick’s bestseller MAYFLOWER,available now in paperback. In a sense the Pilgrim’s did “live happily ever after” because the peace made with Massasoit and the Wampanoag people lasted for fifty-four years. Yes, there were scuffles between natives and the Puritans to the North of the Massachusetts Bay Colony (Boston) but these were short-lived and few lives were lost. They were harder to get along with anyway. But as peace treaties go, the one made between the Pilgrims and Massasoit was a good one indeed. Philbrick tells us of how Massasoit’s son, who came to be known by whites as “King Phillip” was, many years later, unable to maintain the peace. The origins and reasons for the bitter conflict that broke out in 1675 are complicated and an explanation is beyond the scope of this article, but the war that ensued, “The King Phillip’s War”, was bitter and devastating. Many of the New England native groups managed to stay out of it; most did not. The colonists won and the natives who had fought against the whites paid a bitter price. Colonists who had suffered the loss of loved ones were not forgiving. At the war’s end fourteen months later, survivors of the Wampanoag and other rebellious tribes were packed like sardines into ships and carted off to the West Indies to be sold as slaves. It was not a happy ending. I highly recommend Philbrick’s book- a superb read and good solid history. But the King Phillip’s War is another story. Today we celebrate the dinner on the grounds, the happy Thanksgiving communion of native and English, a sort of “brief, shining moment”- like Camelot. And it should be celebrated. And we should be thankful for what we have. I am. There’s a lot to be thankful for. Ninety-three years ago, November 11, 1918, was a day to remember. For my children the big red-letter day, the historic event seared into their consciousness was (so far) the terrorist attacks on 9/11/01. For me and my generation, the “baby boomers” it was the Kennedy assassination in November, 1963. For my parents, the “greatest generation”, it was the attack on Pearl Harbor in December, 1941. Going back a little further, for my grandparents, for that generation, it was Armistice Day, November 11, 1918, the event that ended the great war, now know as World War One. It was supposed to be the war to end all wars, the war to make the world safe for democracy. Of course, tragically, it did neither. This “Great War” was renamed ” World War One” when another world war erupted twenty one years later. And this Second World War was far worse. Had the US not entered World War One, and we know now that had our government worked a little harder, the US probably could have stayed out of it, Armistice Day would have been someone else’s red-letter day. Or perhaps it wouldn’t have happened at all. Yet, on that fateful day close to two million American service personnel were “over there” either in the trenches and heavily engaged or in reserve waiting their turn. Technically the US had been in the war since April, 1917, but it took well over a year for the AEF, the American Expeditionary Force under the command of General John “Black Jack” Pershing, to get into the fight with enough men under arms to make a real difference and tilt the balance of military power against Germany whose forces, under serious pressure in the late Summer of 1918, were slowly being pushed back all across the extended Western Front in France and Belgium. In the last three months of hostilities, the Allied armies captured over a third of a million German prisoners. In the late Summer and early Fall of 1918, their lines slowly but surely gave way as those units not surrendering were pushed back. And back. Earlier that year they had made their final offensive. Another was clearly impossible. The tide had turned. The four year stalemate was over. The Germans were on the ropes and the allies were pounding hard. With certain disaster and the real possibility of an unconditional surrender hanging above them like the sword of Damocles, Germany’s leaders called for a cease fire around the end of October. After a couple weeks of secret and careful negotiations, all was suddenly quiet along the entire Western Front on November 11, 1918 for the first time in over four years. Shell-shocked, war weary British, French, German, and soldiers of a dozen other nationalities blinked their eyes in disbelief. Their long nightmare was over. And, in all honesty, it was the American doughboy, a relative newcomer to the muddy trenches, who had made the difference, providing the decisive margin of victory. Not only was the terrible thing over, Allied forces were sure that they had “won.” On the home front in France, Britain, and the United States, and in all the allied nations, people rejoiced. Curiously enough, people in Germany rejoiced as well. But there was a problem. In the weeks and months proceeding November 11, the German people had been fed a steady diet of misleading optimistic news from their leaders. Though the soldiers in the trenches knew better, the German people were convinced that their leaders had called for a cease fire on the basis of strength, that the ceasefire was simply a response to mutual war-weariness. The long, terrible stalemate was over but this was not, in the German view, due to either side achieving victory. Though they had not exactly won, few Germans believed that they had lost. To them, November 11, was simply a cease-fire and a mutual agreement to end hostilities. It was an “Armistice, not a surrender. It was not even a negotiated surrender with agreed upon terms or technically a surrender of any kind. Many German units marched home in victory parades. Later, the allies were convinced that they had made a mistake, that they should have kept the pressure on just a little longer and forced a real surrender out of the Germans. But that was the wisdom of hindsight. At the time, a cease-fire seemed like a good idea. Yet for the Germans it was good news and bad news, with a great deal more of the latter. Their “boys” were coming home, but they were coming home to a mess. Soon after the Armistice the Kaiser abdicated, creating massive social and political upheaval. In major German cities Communist mobs, inspired by the recent revolution in Russia, fought mobs of returned veterans organized into an ad hoc national police force. German money, already on an inflationary spiral during the war, became almost worthless. Shortages of all kinds worsened. Hundreds of thousands starved. An influenza epidemic further afflicted the suffering population. Distracted by difficulties aplenty, few Germans in early 1919 were aware of how poorly their delegation at Versailles was faring as representatives of the various nations who had participated in the war met to work out the details of a peace treaty. Woodrow Wilson and British Prime Minister Lloyd George did what they could to soften the French desire for revenge, but in the end the French, bitter from the loss of over a million soldiers in the war, prevailed. The French were out for revenge. What should have been a negotiated peace with terms agreed upon by both sides, which is what the Germans and, to his credit, American president Woodrow Wilson, armed with his famous “Fourteen Points”, had had in mind from the beginning, turned into an episode of humiliation with Germany and her allies, at the end of it all, having little to say. The Germans might as well have surrendered unconditionally. At Versailles they were treated as if they had. The harsh terms were simply dictated to them. For them the happy Armistice of November 11 turned to bitter disappointment. President Woodrow Wilson returned to the US feeling like a failure. The US had played a vital role in bringing about the war’s end but could do little to bring about a just and lasting peace. The resulting Versailles Peace Treaty was a bitter pill for Germany to swallow. The map of Europe changed. The old Hapsburg empire, that of Austria-Hungary, was dismembered. German ethnic areas were lost in the creation of a new Poland. The Ottoman Turks, Germany’s ally, saw their Middle East Empire broken up and turned over to the British. The German navy, except for a few token vessels designated for defense, was surrendered to the British and Americans. The mighty German army was reduced as well to a token defense force. French troops swept into the German industrial Rhineland to take control of vital German industries. German colonial possessions, including lands in Africa and islands in the Pacific, were seized and handed out as spoils of war to various allied nations. Even the Japanese, who had played little part in the war, were awarded some islands. And to add insult to all this injury, the German government was forced to pay reparations to England and France at a time when they could scarcely feed themselves. All in all, Germany was made to bear the entire responsibility for World War One leaving the German people bitter and demoralized. No one, of course, knew any of this on Armistice Day, November 11, 1918. That was a red-letter day for rejoicing and merriment. The long nightmare was over and it seemed to all that God was in His Heaven and all was again right with the world. Our heroes were coming home to be celebrated and honored in victory parades and feasts. They had done their duty and made the world safe for democracy. All would be better. Never again would the world be afflicted by such a terrible war. Little did they know.